With some of the best fishing in the United States, Texas has over 80,000 miles of rivers and streams and 400 miles of coastal shoreline and bays, all just waiting for you to set the hook. Pack a bag and grab your gear because it’s time to cast a line in Texas. Texas has miles of coastline with plenty of spots to drop a line and fish for everything from speckled trout to marlin. In port cities along the Texas Gulf Coast highly experienced guides know all the secrets to reeling in the catch of the day. In Port Aransas, a coastal hotspot north of Corpus Christi, a number of chartered boats are available for everyone from serious anglers to first-timers. For a deep sea fishing experience, many other charter companies offer full-day trips with equipment included that will have you reeling in red snapper, wahoo, grouper, blue marlin and more in a matter of hours. For fisherman looking to stay on the shore, Port Aransas’ Keepers Pier is one of the most revered and productive fishing piers on the entire Gulf Coast. Its location, water depth and abundance of fish species make for an outstanding fishing experience that will leave you with memories for years to come. Anglers in search of the perfect “over-the-mantelpiece” marlin or sailfish catch will find a sweet spot at South Padre Island. 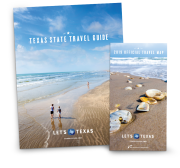 Known for its white sand and blue water, the two-mile slip of land at the tip of Texas is an angler’s dream, with great deep-sea and coastline fishing in nearby Laguna Madre. The best part? Most local restaurants will cook your fresh out of the water catch for a fixed fee. Fishing enthusiasts can fish free of charge in Galveston off the rock groins orbreakwaters along the Seawall for flounder, speckled trout, sheepshead, sand trout, bull reds and gafftop sail. Inshore or bay fishing is great year-round for trout and redfish, and a prime fishing location is the fishing pier at Seawolf Park which is open to anyone with a daily fishing fee. Midsummer through fall, anglers fishing a few miles offshore will see plenty of black tip shark and tarpon. 25 to 40 miles offshore is the domain of the kingfish, snapper, dorado and cobia, while those 40 to 80 miles out will battle the fighting amber jack, grouper, kingfish, red snapper, cobia, dorado, sailfish, tuna and wahoo. For traditional anglers looking for the top lakes in the state, Texas Parks and Wildlife recommends Lake Whitney as a top-notch lake for striped and white bass as well as trophy blue catfish. The “Getaway Capital of Texas” offers scenic views of gently sloping banks, clear and hardwood timber and limestone bluff, making it easy for anyone to fall in love with the great outdoors. The lake of dreams for bass fishing buffs, Lake Fork, holds most of the state&apos;s records for bass fish. Boasting more than 27 thousand acres and a maximum depth of 70 feet, fishermen are likely to catch a largemouth bass, white and black crappie, channel catfish, white bass or sunfish in this reservoir just 65 miles east of Dallas. In Dallas itself, Lake Ray Hubbard covers more than 20,000 acres. The lake is home to large populations of white crappie, hybrid striped bass, largemouth bass, channel catfish and blue catfish. Popular places to fish include Robertson Park, a large day-use area with two boat ramps and great bank fishing access, Lakeside Marina with an enclosed fishing barge and Harbor Bay Marina. Competitive anglers looking to sport will enjoy tournaments all over the state year-round. Popular tournaments for those wanting to reel in the biggest bass include the Toyota Texas Bass Classic at Lake Fork and the world’s oldest open bass fishing tournament, the Texas State Bass Tournament at Toledo Bend on the Sabine River in Shelby. For deep sea fishing tournaments, Matagorda Bay, located northeast of Corpus Christi, hosts numerous tournaments throughout the summer including the Bluewater Challenge Offshore Tournament, Texas King of the Deep Swordfish/Deep Drop Tournament and the Matagorda Big 5 Offshore Tournament. Additionally, Lake Texoma is home to six open striper team tournaments beginning in January and ending in December. Reel in the catch of the day with one of the many local fishing guides at every stop, and see for yourself how great Texas adventures don’t stop at the water’s edge. Whether you’re looking to cast your line into the deep sea or the lake, fishermen far and wide will be hooked after one catch in Texas.